We left the Trout River side of Gros Morne and moved north to Shallow Bay. Route 430 ran through many scenic fishing towns and by lots beautiful coastline. 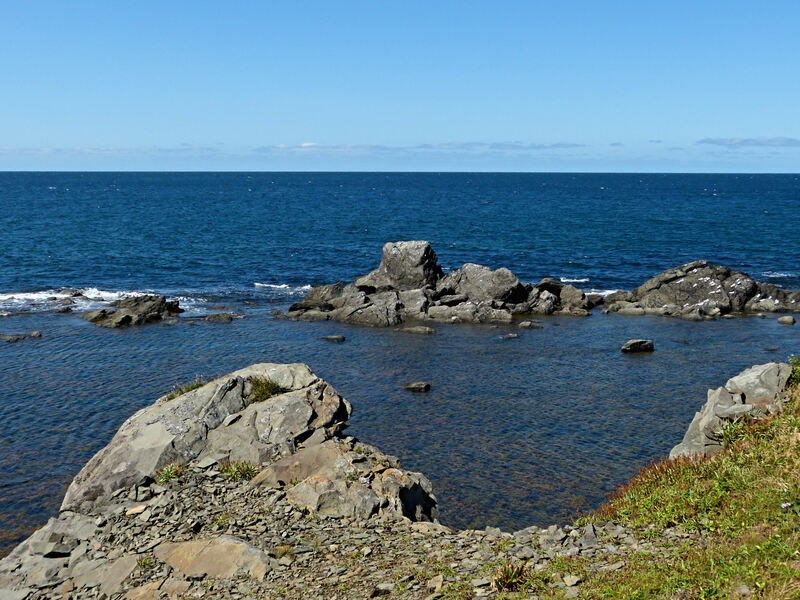 The campground itself is the furthest point north on the Viking Trail that one can go while remaining in Gros Morne Park. Typical of what you see as you drive along Route 430 in Gros Morne NP. The campground of Shallow Bay has a off white sandy beach with miles of coast and very few people. 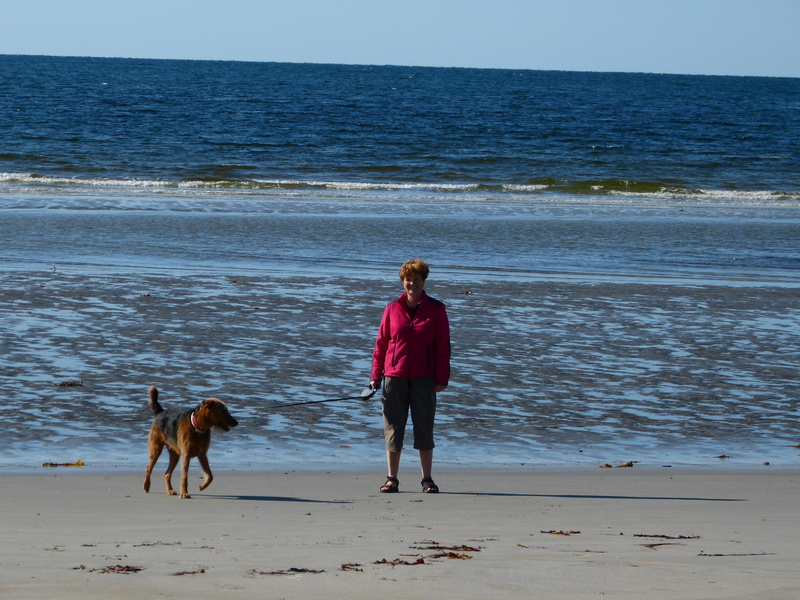 Woolly Bear and I walked the beach early each morning and never had any company. It was pristine, no evidence of people nearby. We are camping here for several days and are not sure where we will travel next.Originally we had planned to drive to the North Peninsula and visit the Viking ruins, but as the vastness of Newfoundland hit us, we realized that our eleven days here would be better spent getting to know the West Coast and Gros Morne more thoroughly. 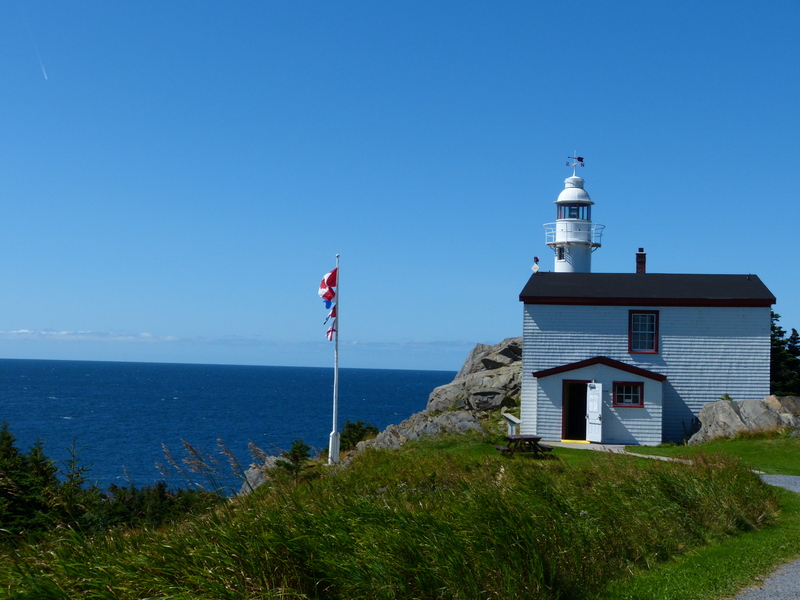 Any of you planning a Newfoundland trip should think of spending three or four weeks here, maybe more. The whales and icebergs are best seen in June or early July, so we have timed our trip poorly. Will just have to return with Newfoundland as the main attraction! Woolly Bear and me on the beach at Shallow Bay Campground, Newfoundland. This entry was posted in Uncategorized on August 23, 2013 by Ramblin' Rose. Next time you go back to Newfoundland you will need to do one of two things. Either bring your only daughter OR bring a satellite phone so you have service 🙂 glad you are having fun. Everything looks so cool. it looks like Woolly is loving the beaches. Where are the icebergs? I studied them well in school if you remember !!! Wow! I must say that your day on Route 430 is QUITE a bit different than my day on Route 22! You are seeing such natural beauty and splendor! You and Woolly Bear look adorably happy too…looking forward to your next post! Hi Sara, Glad that you are enjoying your trip to NL. It is gorgeous, isn’t it! Great to hear that you will plan another trip back there! You really need to tour the whole island! Having lived there for so many years I only traveled to St. John’s once and that was after moving back to the states. There are still many places that need to be visited. Enjoy the rest of your trip!! Pam, Newfoundland is beautiful and the people are so nice and kind. I love it here! But we need a month or two to see it all !